Pheng Lay-Adamczuk is an experienced Events Organiser. Prior to joining Duke CE she was an Event Coordinator at Clarion Events Ltd. In this role she planned and managed international networking events and receptions, organised functions for over 250 attendees, liaised with senior level stakeholders to devise event content and worked independently to manage event enquiries. She has excellent organisational skills and is experienced in negotiating with venues. Pheng also has experience supporting marketing campaigns and training staff. 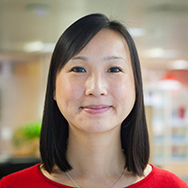 Pheng has also been an Information Manager for London local government, Assistant Language Teacher at Japan Exchange Teaching Programme (in Japan) and worked as a voluntary English Language Assistant in Thailand. Pheng speaks fluent Cantonese and some French. She is qualified in PRINCE2 (Project Management) and Information and Technology Infrastructure Library Foundation Level. Pheng also has a BA (Honours) from Bristol and a Diploma in Event Management (Marketing and Communications).